More than 400 physicians gathered on a street in central Seoul Sunday to protest the arrest of two doctors and one nurse at Ewha Womans’ University Hospital and called for improving Korea’s healthcare system to treat physicians better. The medical workers were recently arrested on charges of negligent homicide of four newborns that died at the hospital late last year. Choi Dae-zip, who was elected as new president of the Korean Medical Association (KMA), and 16 heads of the KMA’s provincial branches led a rally in front of the Dongwha Duty-Free Shop in Gwanghwamun to criticize the court’s issuing of arrest warrants to the Ewha hospital’s medical staffs. 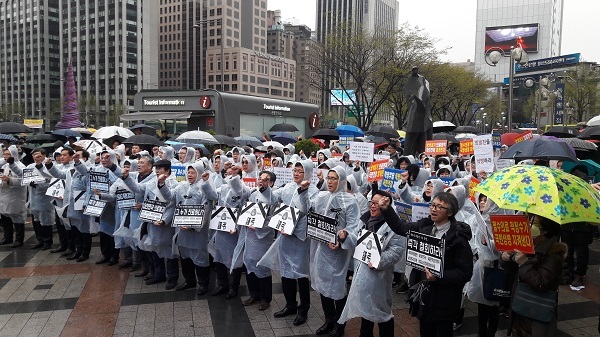 More than 400 physicians from across the country held a rally in front of the Dongwha Duty-Free Shop in central Seoul on Sunday. They protested the arrest of three medical staffs at Ewha Womans University Hospital over the death of four newborns at the hospital’s neonatal intensive care unit late last year. The turnout of the rally had been expected to be low due to rain and the chilly weather, but doctors from various fields such as alumni of the Ewha hospital, clinic owners, and specialists actively participated in the gathering. “As a physician who handles the life and health of patients, I feel heartbroken over the death of the newborns at the Ewha hospital. I once again give my deepest condolences to the children and their bereaved families,” Choi said. “Medical practices are done with good intentions. Which doctor would want to harm patients? But the court ordered the arrest of the Ewha medical staffs because it deemed the results of their medical practice not good. The court treated the doctors as if they were murderers,” he added. Choi also ranted that if a similar situation reoccurs, physicians will quit their jobs from intensive care. “They have been doing their best to care for patients, but if we treat them like a sinner with only bad treatment results, they will leave quietly from intensive care fields. If doctors quit, the public will directly get the damage,” he said. “Let’s all rise to completely change the wrong practices of the prosecutors, police and the court,” Choi shouted. The demonstration heated up as Choi started reading the KMA’s resolutions. Choi and the 16 heads of the KMA’s regional branches urged the government to identify the cause of the Ewha incident and address the distorted healthcare system in treating severely ill patients. The group of 130,000 doctors demanded that the government establish a special investigation committee, including experts from the medical community, investigate real problems, reflect the opinions of the doctors, and tackle the structural problems in the nation’s medical care for patients in ICUs. The doctors also urged the government to establish “Special Law on Medical Accident” so that they can do their best to treat patients without fear of becoming a criminal when clinical results are negative. They also urged the government to streamline the complex evaluation criteria for medical services, set by the Health Insurance Review & Assessment Service (HIRA) and the National Health Insurance Service (NHIS), and to disclose them. Choi and the 16 heads also called for the government to apply the Labor Standards Act to all medical fields, to encourage doctors with poor working conditions such as those in ICUs to offer their best medical services. The government should raise the medical reimbursement rate to an OECD (Organization for Economic Cooperation and Development) average to give the right amount of pay for doctors’ optimal care, they claimed.